and leaks urged a Minnesota federal judge on Monday to grant final approval to a settlement worth up to $21 million. Uponor’s allegedly defective fittings installed in their homes. PEX (E.P.) EP Engineered Polymer Fitting are being phased out and discontinued. Repiping is a process of installing a new Copper repipe system. This process usually includes removing old readily accessible pipe and then installing the new plumbing system. Included in the process is the installation of new USA type "L" hard copper, properly strapped and secured, install kwik 1/4 turn ball type water stops, install new stainless steel water supply lines. After the new piping system is installed the water is turned back on, the system is pressure tested and then flushed out. The repiping process takes 1-3 days to install the new piping system. After the actual plumbing replacement, there will be some required wall and/or ceiling patching. A professional plumbing site survey is part of our repiping process. Standard repiping projects include installation of all new hot and cold domestic water piping from the water source to all existing faucets and fixtures. Unless specifically included in the proposal, drain replacement and fixtures are not included. Repipe or re-piping is a process of replacing the supply pipes in a dwelling or business. It is a complete replacement of your supply plumbing system. There are several reasons you may need to repipe your home or business. 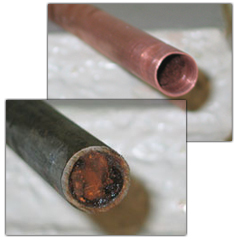 Corrosion of pipes may cause low water pressure, rusty colored water, reduced water flow, or Slab or Pin hole leaks. If you are going to remodel it is a good time to repipe before you paint or finish your walls. It is important to understand the scope of the project before work is started. If you notice an isolated leak or a small portion of your existing piping leaking, or valves that are corroded or cracked, it is quite possibly an indication of a larger problem. solution for leaking water pipes under your slab. Slab leaks are very serious, because all of that leaking water under your slab can cause your foundation and slab to sink. Slab leaks can create sink holes under your house. Any slab leak can result in thousands of dollars in damage. That damage can be direct water damage to floor coverings like carpet, wood floors, walls, and indirect damage like mold growth. Do not delay - Henrik Plumbing is the solution for your slab leaks. We provide free estimates . We are true repiping experts. We have repiped homes, apartments, and commercial buildings. This means that when we come to your job site you have a highly experienced crew working on your project. We provide the highest quality re-pipe job in the industry, and this with a double the difference price guarantee (see details). We offer the highest quality for the best price - guaranteed! What is Repiping? As the pipes of a plumbing system age, the pipes will need to be replaced because of rust, corrosion, leaks, slab leaks, pin hole leaks, low water pressure, and rusty water. This replacement process is referred to as re-piping or a repipe. The re-piping process is also known as a repipe job (or re-pipe, re-piping, repiping, and new piping, re-plumbing, re plumbing and piping replacement). Re-piping and repipe is part of the plumbing license classification. We are licensed repiping experts, we are experienced repipe plumbers. Henrik Plumbing specializes in USA Type "L" Hard Copper re-piping. Our crews have more experience on how to install, lay out the job, order parts, and inspect the re-piping process. We are repiping experts. We have expert patching crews in house. 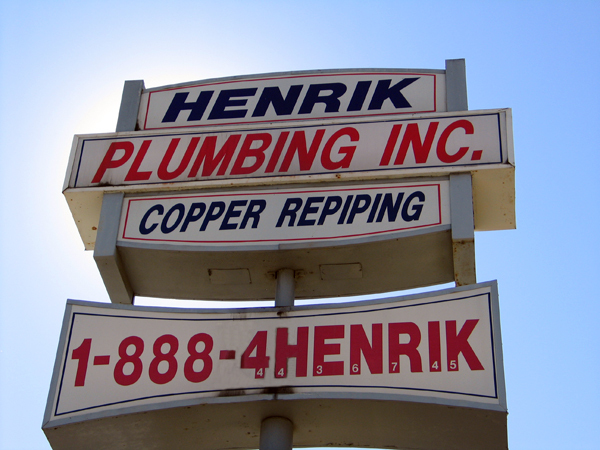 We at Henrik Plumbing Inc. are true Copper Repiping Experts. Call us today and let one of our plumbers give you a free in home estimate, and show you how we can repipe your home or investment property, better, and for less money - guaranteed! Take a moment to review our PLUMBERS COMPARISON CHECKLIST and you will be confident that we are the best in the industry. new piping system. After the actual plumbing replacement, there will be some required wall patching. replacement and fixtures are not included. Plumbing is the art and science of working with metals. Over time the quality of plumbing, and plumbing materials has evolved, changed, and improved. These improvements increase the quality of Life. Even though plumbing has a connection to metals, plumbing materials are not always metal. In the past plumbing was made of lead, copper, stone pipes (stones with holes), wooden pipes (red wood plank boxes, bricks, blocks of rock, and clay. They were used to form water way channels and pipes. Plumbing can bless our lives in many ways, like saving us a trip to the river or lake for a drink or a bath, and save us from going to the out-house. We can take a hot shower, run the dishwasher, get ice from the ice maker, wash the clothes in the washing machine, and water our lawns and gardens. there are a lot more people and a fixed amount of water. We have to properly dispose of our waste water, keeping it separated from our drinking water. Sometimes the problem is what is inside the water, and sometimes the problem is the piping material that carries the water. Plumbing materials can be dangerous. The old but sage saying “buyer beware” is the best advise. There are links and information on this site to help you to become aware. supply their water, and the rest is history. Plumbers still have many problems to solve as populations increase. very expensive. Copper pipe is becoming more expensive. Plastic and poly pipes cost less. There are many pipe material choices. Some plumbing materials today can make you sick, insane, sterile, blind, and even bring on death. supply household water. When plastics burn they release a deadly poisonous gas called Dioxin. a failure the pipe or joints usually blow apart and cause a costly flooding. Plastics do not stand up to sun light either. supply systems contain lead. If you have older plumbing pipes you should have it replaced even before your pipes leak or rust shut. Waste water and sewer water can be a health hazard, and must be kept safely separated from rivers, lakes, streams, wells, the water table, and oceans. water tables and storage supplies with drugs and chemicals that are leaching in. will be properly treated with "safe” chemicals like fluoride and chlorine (two poisons). Plumbing is the most important service system in your home. ike dishes, eating utensils, pots, and pans. from bathroom sinks, tubs, showers, and laundry that contains minimal bio-organic matter. and installations. Plumbing codes can be different from state to state, or from city to city, there can also be codes that are universal in application. water table levels, streams, rivers, lakes, altitude, temperature, and soil conditions. would be considered a "private water" supply system. If the water were supplied by a local agency it would be considered a "public water" supply system. treated with filtration, ozone, or chlorine separately or in combination before it enters the house for use. Content copyright . repipe repiping . All rights reserved.